Because of how important these tiny devices are to your everyday life, it is especially important to shop wisely to ensure that you purchase the best possible hearing aid for your needs. Your hearing aid is a crucial connection between you and the sounds of your day, from conversations with friends and family to music and sounds of your experiences. Because of how important these tiny devices are to your everyday life, it is especially important to shop wisely to ensure that you purchase the best possible hearing aid for your needs. If you are currently in the process of looking for your next hearing aid, consider these smart questions to ask before you buy. Which Model Will Work Best for Me? As you shop for your next hearing aid, your audiologist will guide you through the process of finding a model that works best for your needs and preferences. 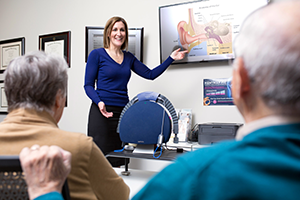 A hearing aid will typically consist of three main features including a microphone, noise-reduction mode, and some form of feedback suppression to enable your hearing aid to work as well as possible for you throughout your day. While most basic hearing aids work well without too many accessories, your audiologist may recommend one or two additions that will help your hearing aid meet the specific needs of your lifestyle. The fit of your hearing aid is a crucial consideration for your decision, as the right hearing aid should be hardly noticeable to you throughout your day. Work with your audiologist to make sure that your hearing aid fits your ear perfectly so you are able to participate in all the activities that you love. If you regularly exercise or engage in outdoor activities, you will want to be especially certain that the hearing aid fits you comfortably so that it does not inhibit you from going out and enjoying the day. Is the Model Locked by This Provider? If you are purchasing your hearing aid from a larger chain retailer or practice, you may want to consider that some models of hearing aids may be exclusive to that chain. This means that these models can only be serviced through the specific provider from which you bought it, making it especially difficult to have it programmed or serviced at a different office. When you are purchasing your hearing aid, it is important to make sure that you are allotted at least 30 days or more to possibly return your hearing aid for a full refund. You will also need to consider the time that it may take for you to fully adjust to the new hearing aid, which may even take several weeks. In this time, your brain will need to adjust to hearing new sounds or sounds you that you may not have heard for an extended period of time. This entry was posted on Thursday, May 3rd, 2018 at 2:20 pm. Both comments and pings are currently closed.